It is the cricketing shot played by the batsman on the back foot by transfering body weight on it. In fact the batsman tries to transfer his body weight naturally on the back foot to play fuller or good or short length deliveries. The transfer of body weight either on the back foot or front foot is such an important factor to be always kept in mind by the batsman since to play a shot properly it is the transfer of body weight which creates a lots of energy into the arms of the batsman which indeed is the key in hitting the ball at the end of playing a shot. At the end of the day the batsman has to put his weight either on the front or back foot to play any kind of cricketing shot since the batsman could be in trouble most of the times if weight of the body stays in the air during playing a shot. Generally the shorter length and good length deliveries are played on the back foot by the batsman. Cuts in square and third man region, drives in mid-off, mid-on, square and cover region, leg glances, wristy and flick shots in leg side region, hook shots in square and fine leg region, pulls in square and mid-wicket region can be played on the back foot. How should a batsman use his back foot when he plays a shot ? Before the batsman begins using his back foot the batsman should make sure himself how well his back foot is flexible and ready to move backward on the spot in time from position zero (Batting Guard) when the pitch of the ball happens. Therefore the basic step to be taken by the batsman would be the way how he stands in or outside the crease while taking guard. While taking guard the distance between the front and back leg shouldn’t be too far or less. 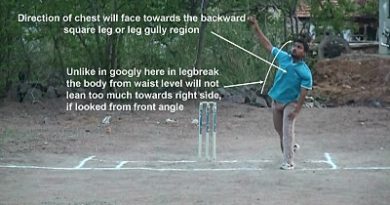 If a batsman stands with a legs of too far distance the basic problem would be, the batsman will not be able to get back his foot comfortably in time when he wants to play on the back-foot. Especially when the batsman wants to play a bouncing good length or shorter length deliveries really feels difficult in picking them with this guard since these deliveries are mostly and perfectly played on the back-foot by the batsman. 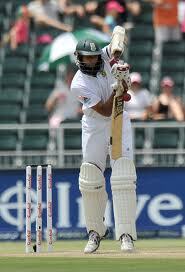 It is the “Comfortable distance” which has to be maintained between the two legs by any batsman while taking guard. The word “ Comfortable distance “ is such an important word for any good batsman who would like to move his feet forward or backward comfortably with full freedom in time when required. No one knows what exactly is the common measurement maintained for the Comfortable Distance and there is no any rule to follow any particular standard distance between the legs by the batsman. It is only the batsman who exactly knows himself to what distance he feels comfort. Finally with this comfortable guard the batsman will be able to switch on his feet to move backward or forward in time with greater flexibility. Hence this is the first major step to be looked after by the batsman before he starts playing on the back foot. Judging the line and length of the ball, balance, high back lift, use of bottom hand, transfer of weight, focus, position of head according to the shot played, and follow through are the other important things to be kept in mind when a batsman plays on the back foot. Along with these, depending on the style of batting the batsman needs to concentrate on some other things like if a batsman would like to play with a straight or vertical bat positions he should make sure himself not to play too away from the body, should play very close to the body as much as possible by moving according to line of the ball. Here the batsman need not to worry about the bounce of the ball as long as it is played on the back foot with a straight bat position, the only worrying factor would be the swing of the ball since playing a swing on the back foot is always difficult when compared to playing it on the front foot. How to deal with the swing on the back foot at different lengths is explained later in this article. Similarly when a batsman wants to play with a horizontal or cross bat positions like if played with horizontal bat position the batsman has to be careful in dealing with the bounce since the bouncing deliveries are always a threat to horizontal bat shots. At the chest or shoulder level position it is always difficult for the batsman to contact the ball properly with horizontal bat direction when the ball bounces enormously to shoulder or above shoulder level position specially at some of the great bouncy cricket tracks like WACA Perth, Gabba Brisbane etc. And when played with horizontal bat position on the back foot the swing of the ball would not be a big problem to deal with (specially the out swingers) as long as there is no bounce since it is the direction of position of horizontal bat which makes the batsman to reach and dominate the swing of the ball specially bowled at shorter and good lengths. And finally if played with cross bat position on the back foot or even some times on the front foot the batsman has to be careful in dealing with both the swing and bounce of the ball. Since it is the position of cross direction of the bat during the impact of the ball which makes the batsman difficult to control or dominate over the swing and bounce of the ball at a same time. It would be ideal for the batsman to play with a cross bat position when there is no swing and bounce. Why only the back foot ? By playing on the back foot the batsman always gets more time to react and judge pace and bounce of the ball specially the deliveries bowled at shorter and good lengths. Here on the back foot the batsman always waits for the ball to hit with the bat unlike on the front foot the batsman tries to reach the ball by bringing front leg closer to pitch of the ball, in the process of trying to reach the ball naturally the batsman doesn’t wait for the ball to reach to the bat which results in having very less time to judge the pace and bounce of the ball. On a slower track where the pace of the ball will not be true, the ball stops a bit and doesn’t reach nicely to the bat after hitting the deck. Instead of trying to reach the ball using the front leg the batsman just waits for the ball on the back foot to judge pace of the ball. E.g. Indian sub continent pitches. Similarly on a fast bouncing tracks where the ball bounces enormously to shoulder or above shoulder level position for the deliveries bowled at shorter and good lengths, the batsman using front leg could feel difficult in dealing bouncers at these lengths and even some times at fuller lengths, hence to be safer the batsman just waits for the ball and tries to get more time to judge bounce of the ball by playing it on the back foot. E.g. Australian, England and South African pitches. On any kind of track when the ball becomes old and softer and on a fourth or fifth day of the Test cricket match when the pitch becomes slower and rougher, specially in a spin and medium pace bowling to get rid of incoming and bouncing deliveries bowled at good lengths and even some times fuller lengths the batsman just tries to play it on the back foot.. Hence most of the good batsmen try to utilize and get more time to judge pace, movement and bounce of the ball by playing it on the back foot for the shorter and good length deliveries. Most of the good batsmen strongly feel it and may be it is true that naturally it is easy for the batsman to transfer his body weight more and strongly on the back foot rather than on the front foot specially when the batsman wants to play powerful hard hitting shots like cross bat or horizontal bat slogs or pulls or hooks or picks on leg side region, powerful swings of the bat or flicks of the wrist on leg side region, powerful cuts over the point and backward point region, powerful lofted drives over the cover and extra cover region etc. 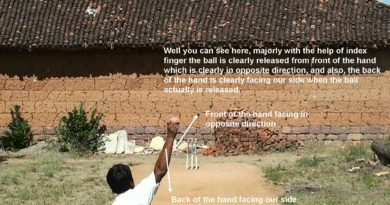 Some of the cricket intellectuals believe that these powerful cricketing shots could be played properly by the batsman only on the back foot. We can see some of the good batsmen in slog overs or when required try to clear their front leg from front of the wicket and just transfer their body weight strongly on the back foot creating a lot of energy into the arms to hit the ball hard and powerfully on leg side or off side region. And finally depending upon style, confidence and ability, no matter what the risk is, some of the typical batsmen use their back foot even for the swinging or moving deliveries bowled at good and fuller lengths which actually should be played on the front foot to be safer. E.g. Virender Sehwag, Shahid Afridi etc. Why it is safer option for the batsman to play swinging or moving deliveries on the front foot rather than on the back foot bowled at fuller or good lengths ?